Our delicious homemade granola bar recipes make granola bars that are so much tastier and healthier than the ones in a box! 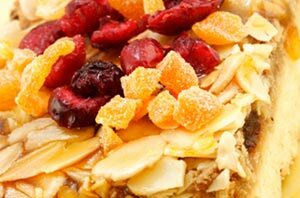 Healthy granola bars come in lots of different flavors and styles. 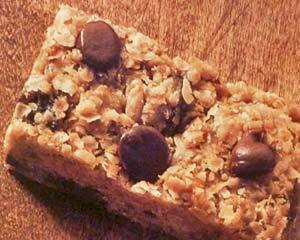 Some granola bars are chewy; some are crunchy. Some have long lists of ingredients and others just a few. Some granola bar recipes call for prepared granola, while others call for common granola with ingredients such as rolled oats, nuts, fruits, and a variety of sweeteners. The key is to find healthy recipes for granola bars in flavors and styles that are right for you. It's also important to remember that these recipes are meant to be a guide and you should feel free to experiment when making your own granola bars. If your recipe calls for raisins, and you prefer dried cherries, make the switch. Baking is meant to be fun and creative, provided your substitutions make sense, such as one kind of fruit or nut for another. If you have ever wondered how to make your own granola bars, you will be surprised at just how easy it is! Our collection of granola bar recipes are meant to be quick and easy just like other bar cookie recipes, only healthier. Most contain dried fruits and nuts, and often call for whole-wheat flour. We've gathered our favorite healthy recipes for granola bars here for you and hope you will try one of these delicious snacks that you can enjoy any time day or night. Wholesome granola bars lightly sweetened with maple syrup and studded with dried blueberries make a delicious snack. Although the combination of blueberries and maple is delicious, feel free to substitute the dried fruit of your choice. Dried cherries, cranberries, or raisins all would be delicious. You should be able to find unsalted sunflower seeds in your local health foods store or in the natural foods section of your supermarket. If you can't find unsalted you could always give salted ones a quick rinse and dry since the recipe calls for toasting them before they are added with the other ingredients. Although the recipe calls for unbleached all-purpose flour, I've had good success using King Arthur's white wheat flour in its place. This recipe calls for pure maple syrup for which there is no substitution. Don't be tempted to use maple-flavored pancake syrup in its place! Preheat the oven to 350F degrees. Line an 8-inch square baking pan with heavy duty aluminum foil, making sure there is a 1-inch overhang all around the sides of the pan. These will be used as "handles" to remove the granola bars from the pan once they are baked. Set aside. Spread the oats, walnuts, and sunflower seeds on an ungreased baking sheet and bake until they are lightly toasted, stirring every 2 to 3 minutes. This should take about 10 minutes. Remove baking sheet from the oven and allow the mixture to cool completely before proceeding. In a small mixing bowl, whisk together the flour, baking powder, cinnamon, and salt until well combined. In a large mixing bowl combine the canola oil, brown sugar, and maple syrup until the mixture is smooth and well blended. Stir in the egg and vanilla extract. Stir in the flour mixture until it is just incorporated. Stir in the oat mixture until everything is well combined. Stir in the dried blueberries. Pour the batter into the prepared baking pan. Bake the granola bars until they are set, about 25 to 30 minutes. Remove from the oven and allow to cool completely on a wire rack. Lift the foil "handles" on either side of the pan to remove the slab of granola bars from the pan. Place them on a cutting board. Cut into desired size and shape bars. This recipe yields about 16 Maple Blueberry Granola Bars from an 8-inch square baking pan. This great homemade no bake granola bar recipe is adapted from Mom's Big Book of Baking: 200 Simple, Foolproof Family Favorites for Birthday Parties, Bake Sales, and More by Lauren Chattman. This recipe makes delicious chewy, crunchy healthy granola bars full of oats, dried fruit, and whole grains, lightly sweetened with the natural goodness of maple syrup instead of sugar. Try them once and we think you will want to make them again and again. These healthy granola bars are just that good. You'll need a food processor to make these quick and easy granola bars. Grease a 9x13-inch baking pan with cooking spray. Place oats, sunflower seeds, wheat germ, flour, fruit, almonds, dry milk, and cinnamon in a food processor and pulse until everything is chopped and well blended. Spread the thick batter evenly into the prepared pan and bake until lightly browned, about 15 to 20 minutes. Allow to cool and a wire rack on the counter for 10 to 15 minutes. Once they are completely cool, you can store these fruity, nutty, chewy, healthy granola bars in an airtight container for up to 3 days. This healthy granola bars recipe is adapted from The Food You Crave: Luscious Recipes for a Healthy Life by Ellie Krieger. Preheat your oven to 350F degrees. Line an 8-inch baking pan with foil that overhangs the pan on all sides by at least one inch. Lightly grease the foil. In a small bowl, combine the wheat germ, flour, baking powder, salt and cinnamon with a whisk until blended. In a large mixing bowl, stir the oil and brown sugar with a whisk until smooth. Stir in the egg and vanilla. Stir in the flour mixture just until combined, then stir in the oat mixture and dried fruit until well combined. Pour the mixture into the prepared baking pan, spreading evenly. Bake the bars until they are set, about 25 to 30 minutes. These Homemade Granola Bars will keep at room temperature in an airtight container for up to 5 days. Yield: Makes one 8-inch pan of Homemade Healthy Granola Bars. This great homemade no bake granola bars recipe is adapted from Mom's Big Book of Baking: 200 Simple, Foolproof Recipes for Delicious Family Treats to Get You Through Every Birthday Party, Class Picnic, Potluck, Bake Sale, Holiday, and No-School Day by Lauren Chattman. This healthy granola bar recipe is full of tasty healthy ingredients including almond butter, whole grain puff cereal, seeds, nuts, dried fruit and sweetened with brown rice syrup. Making these healthy granola bars will probably require a trip to the health food store for brown rice syrup and quinoa flakes, but it's definitely worth it if you want a healthy homemade granola bar made without sugar, that is packed with protein from almond butter and quinoa. They stir together in just a few minutes and require no baking. Lightly coat a 13x9-inch baking pan with cooking spray. In a large saucepan, heat almond butter and rice syrup over low heat until bubbles begin to form. Quickly stir in walnuts, fruit, seeds, cereal, and quinoa flakes until well combined. When the mixture is cool enough to handle, press into the prepared pan and cool completely. Cut bars into desired size and shape and wrap pan tightly or wrap bars individually for on-the-go convenience. This recipe makes one 13x9-inch pan of No Bake Almond Cereal Bars. This healthy granola bar recipe is adapted from Canyon Ranch Cooks: More Than 200 Delicious, Innovative Recipes from America's Leading Health Resort by Scott Uehlein. These nutritious, energy-packed homemade bars are perfect for snacking or on-the-go. In a large bowl, combine brown sugar, peanut butter, corn syrup, melted butter and vanilla and blend well. This recipe makes one 13x9-inch pan Chewy Chocolate Chip Granola Bars.